Book Blogger Appreciation Week gives me the opportunity not only to discover new book blogs and wade through the expansive book blog world, but also to learn more about the bloggers behind the blogs. Today, it's my pleasure to introduce my readers to a fellow book blogger, Margot at Joyfully Retired, as part of the BBAW interview swap. As you can probably guess from her title, she doesn't blog much about kidlit. Rather, her blog is more of a mixture of posts on cooking and traveling combined with all her book reviews of mainly adult fiction and cookbooks. Could you share a little about your life and how blogging fits into your weekly routine? When my husband and I retired four years ago our goal was to travel around the country in our RV. The first two years we were in a hurry to see it all. I wanted a way to record what I'm doing plus keep our friends and family up-to-date on our activities. My son suggested blogging and I've been at it for almost two years. I know this may sound weird but blogging has helped us to slow down and focus on the things we really want to do. I've always loved to read so a blog about my life would have to include books. Food and travel are two other passions so I also do posts on those things. I've found there are so many other people besides family and friends who love to talk about these subjects, so blogging has led to many new friendships. 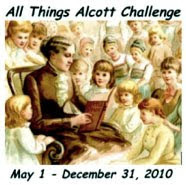 On your sidebar you list a number of reading challenges, including one you started, the All Things Alcott Challenge. What do you like about doing challenges? Why Alcott? Joining challenges is like playing a game or accepting a dare from a friend. For instance, I'm in the Agatha Christie Challenge and it was as if someone said to me, "I bet you can't read every single book she's ever written and in order of their publication date." And it was as if I said, "Of course I can. I'll prove it to you!" In this case, it helps that I love Agatha Christie's books because there are 87 of them. Most of the challenges I'm participating in are like that. I started the All Things Alcott Challenge for a number of reasons. One is that I've loved Little Women since I was a child. I've always wanted to read the other things she's written. This year I read The Lost Summer of Louisa May Alcott by Kelly O'Connor McNeed and that renewed my desire for more of Ms. Alcott. I was sure there were other people who wanted to do the same so I issued the challenge. It's been great to meet so many other people with the same interest. As a Wisconsin gal, I was most interested in your post about the place you fell in love with books -- Simmons Library in Kenosha, Wisconsin. Did you grow up in Wisconsin? What is your favorite thing about Wisconsin? I was born in Kenosha and lived there until I was 14. My parents moved me and my three siblings to Southern California for my dad's job. We left behind grandparents and numerous aunts, uncles, cousins, and friends. It was a traumatic move for me. Four years later I went to college in the Midwest, married my husband and spent the rest of adult life as a Midwesterner. My heart loves Wisconsin and the good things of the Midwest: the four seasons, love for and dependence on the land, people who make eye contact and smile, and the open skies that stretch across open fields and lakes. What is one book you remember reading aloud to your children? Books written just for children are one of life's greatest treasures. That's why I was so glad to meet you and discover your blog. Children see life with their eyes wide open and a unique sense of humor. For me the best children's books reflect those traits. Since my husband and I both love to read we determined to read to our children from birth. It's impossible to remember all those books. There is one book, however, that I read after dinner one year that all three of my children remember. It was The Long Winter by Laura Ingalls Wilder. It just so happens that we were living in the country and that year was an extremely snowy and cold winter. Our children were approximately five to ten at the time and this story, and the weather, captured their imaginations. As adults they still talk about it. I’m so glad to meet a blogger who has devoted her blog to primarily children’s books. I’m always looking for something new and different for my two granddaughters. Brimful Curiosities is now a great resource for me. For other book blog interview swaps, visit the Book Blogger Appreciation Week website. And, visit Joyfully Retired today to read my answers to Margot's interview questions. Lovely interview. At first when, like you, I was paired with a blogger who blogs about books SO different from my main interest I was a bit taken aback, but actually it's all worked very well. I'm glad to see you all doing a swap, because I follow both of you, love your blogs, and think you two are a natural fit - often you each talk about things that would interest the other! Great interview. I love the idea of traveling around the country in an RV and I'd love to do something similar some day. I've been trying to think of some good books to read to my kids and Laura Ingalls Wilder books are a great idea. I'll have to give that a try. What a lovely interview! I'm envious! I'd love to travel around the country in an RV! It was great to meet you, Janelle, and learn of the things that interest you. Your blog is now firmly in my Google Reader. I'm looking forward to your book recommendations for my granddaughters and those fun science projects. Nice to discover your blogs! A love of books makes it easy to find some common ground -- even if reading tastes (or blogs) can seem very different! Seriously great interview. I follow both of your blogs, and it was fun to see you interact through this question and answer format. I'm tempted by that Alcott challenge too...for the re-read aspect! I love Margot's job - she is such a warm and gracious person. Margot is one of my favorite bloggers :) I'm so glad you found her too. I only recently discovered Margot's blog, so it was great to get to know more about her. It sounds fascinating to be able to travel around the country like that.